I've been tracking our net worth on NetworthIQ for over a year now. About a year worth of the tracking includes the combined finances for my wife and I post marriage. In that time our total net worth has increased by around $34k. Thats pretty good. Much of the ups and downs of our net worth has been due to the short term fluctuations of the stock market and gradual changes of the real estate values. In the past 6 months our net worth has jumped by over $60k and most of that is from stock and real estate changes. However the value of stocks and real estate are really only "paper profits" and that increase could erode or crumble rather quickly. 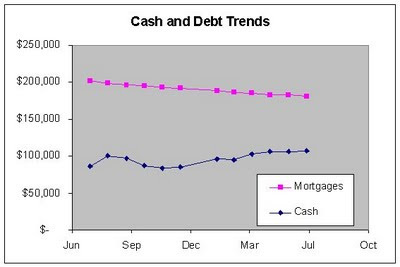 I figured it would be a good idea to look at the trend in our net worth by looking at our cash and debt figures. Cash and debt are concrete things that won't fluctuate due to changes in the market environment. If the market crumbled tomorrow we may lose our retirement growth but our cash and debt would be unchanged. Plus both our cash and debt balances are directly within our control and will go up or down based solely on our actions. The trend in our cash and debt is a better reflection of how our actions are impacting our financial state than the net worth as a whole. Our cash balance has grown over $21k and our debt balance has dropped over $20k. Combined that is a $40k increase in net worth. Both our cash and debt are going in the right directions. This is a good affirmation that our net worth is going in the right direction due to our actions and not just from increases in stock or property values. If you look closely at the cash values you'll see that from August 2008 to November 2008 our cash dropped by about $16k. Part of that is due to funding of my Roth IRA for $5k. During the end of 2008 we also had a vacant rental that we were working on getting in shape to rent as well as paying the mortgage on. The rent on that houses is about $1000 a month. A third reason our cash was dropping was normal seasonal spending on travel and such for Thanksgiving and Christmas. On the other hand from December 2008 til July 2009 our cash balances grew by over $22k. In general there are going to be some seasonal fluctuations in our cash balances due to such things as holiday spending, annual bonuses and funding of our retirement accounts. You can see the amount of debt we have in our mortgages steadily dropped month over month. As we pay our monthly mortgage payments the principal balance in the debt is whittled away bit by bit. Plus we are also paying extra towards the principal on our primary home loan. I'll continue to track our Net Worth including stock, retirement and real estate values but its also good to check and make sure that the cash and debt are trending the right way.